Over the past few years, I have written a number of posts (e.g., here, here and here) posing — and trying to answer — the question: what is this strange thing called “currency manipulation?” I have to admit that I was actually moderately pleased with myself for having applied ideas developed by the eminent Australian international-trade and monetary economist Max Corden in a classic paper called “Exchange Rate Protection.” Unfortunately, my efforts don’t seem to have pleased – even minimally – Scott Sumner who, in a recent post in his Econlog blog, takes me to task for applying the term to China. Now I get why Scott doesn’t like the term “currency manipulation.” The term is thrown around indiscriminately all the time as if its meaning were obvious. But the meaning is far from obvious. The term is also an invitation for demagogic abuse, which is another reason for being wary about using it. A country can peg its exchange rate in terms of some other currency, or allow its exchange rate against all other currencies to float, or it can do a little of both, seeking to influence its exchange rate intermittently depending upon a variety of factors and objectives. A pegged exchange rate may be called a form of intervention (which is not — repeat not — a synonym for “manipulation”), but if the monetary authority takes its currency peg seriously, it makes the currency peg the overriding determinant of its monetary policy. It is not the only element of its monetary policy, because the monetary authority has another policy objective that it can pursue simultaneously, namely, its holdings of foreign-exchange reserves. If the monetary authority adopts a tight monetary policy, it gains reserves, and if it adopts a loose policy it loses reserves. What constrains a monetary authority with a fixed-exchange rate in loosening policy is the amount of reserves that it is prepared to forego to maintain that exchange rate, and what constrains the monetary authority in tightening its policy is the interest income that must forego in accumulating non-interest-bearing, or low-interest-bearing, foreign-exchange reserves. What distinguishes “currency manipulation” from mere “currency intervention?” Borrowing Max Corden’s idea of exchange-rate protection, I argued in previous posts that currency manipulation occurs when, in order to favor its tradable-goods sector (i.e., exporting and import-competing industries), a monetary authority (like the Bank of France in 1928) chooses an undervalued currency peg corresponding to a low real exchange rate, or intervenes in currency markets to reduce its nominal exchange rate, while tightening monetary policy to slow down the rise of domestic prices that normally follows a reduced nominal exchange rate. Corden points out that, as a protectionist strategy, exchange-rate protection is inferior to simply raising tariffs on imports or subsidizing exports. However, if international agreements make it difficult to raise tariffs and subsidize exports, exchange-rate protection may become the best available protectionist option. The three concepts mentioned in the title of the post are completely unrelated to each other. So unrelated that the subjects ought not even be taught in the same course. The nominal exchange rate is a monetary concept. Real exchange rates belong in course on the real side of macro, perhaps including public finance. And protectionism belongs in a (micro) trade course. The nominal exchange rate is the relative price of two monies. It’s determined by the monetary policies of the two countries in question. It plays no role in trade. Scott often cites sticky prices as an important assumption of macroeconomics, so I don’t understand why he thinks that the nominal exchange rate has no effect on trade. If prices do not all instantaneously adjust to a change in the nominal exchange rate, changes in nominal exchange rates are also changes in real exchange rates until prices adjust fully to the new exchange rate. Protectionism is a set of policies (such as tariffs and quotas) that drives a wedge between domestic and foreign prices. Protectionist policies reduce both imports and exports. They might also slightly affect the current account balance, but that’s a second order effect. A protectionist policy causes resources from the non-tradable-goods sector to shift to the tradable-goods sector, favoring some domestic producers and disfavoring others, as well as favoring workers specialized to the tradable-goods sector. Whether it affects the trade balance depends on how the policy is implemented, so I agree that raising tariffs doesn’t automatically affect the trade balance. To determine whether and how the trade balance is affected, one has to make further assumptions about the distributional effects of the policy and about the budgetary and monetary policies accompanying the policy. Causation can go in either direction from real exchange rate to trade balance or from trade balance to real exchange rate. In the following quotation, Scott ignores the relationship between the real exchange rate and the relative pricesof tradables and non-tradables. Protectionist policies, by increasing the relative price of tradables to non-tradables, shift resources from the non-tradable-goods to the tradable-goods sector. That’s the sense in which, contrary to Scott’s assertion, a low real-exchange rate makes enhances the competitiveness of one country relative to other countries. The cost of production in the domestic tradable-goods sector is reduced relative to the price of tradable goods, making the tradable-goods sector more competitive in the markets in which domestic producers compete with foreign producers. I don’t say that increasing the competitiveness of the domestic tradable-goods sector is a good idea, but it is not meaningless to talk about international competitiveness. Real exchange rates influence the trade balance. When there is a change in either domestic saving or domestic investment, the real exchange rate must adjust to produce an equivalent change in the current account balance. A policy aimed at a bigger current account surplus is not “protectionist”, as it does not generally reduce imports and exports, nor does it drive a wedge between domestic and foreign prices. It affects the gap between imports and exports. . . .
A low real exchange rate is sometimes called a “competitive advantage”, although the concept has absolutely nothing to do with either competition or advantages. It’s simply a reflection of an imbalance between domestic saving and domestic investment. These imbalances also occur within countries, and no one ever worries about regional “deficits”. But for some odd reason at the national level they become a cause for concern. Some of this is based on the mercantilist fallacy that exports are good and imports are bad. This is where Scott turns his attention to me. Currency manipulation has become a favorite bugbear of critics of both monetary policy and trade policy. Some claim that countries depress their exchange rates to give their exporters an unfair advantage in foreign markets and to insulate their domestic producers from foreign competition. Others claim that using monetary policy as a way to stimulate aggregate demand is necessarily a form of currency manipulation, because monetary expansion causes the currency whose supply is being expanded to depreciate against other currencies, making monetary expansion, ipso facto, a form of currency manipulation. As I have already explained in a number of posts (e.g., here, here, and here) a theoretically respectable case can be made for the possibility that currency manipulation can be used as a form of covert protectionism without imposing either tariffs, quotas or obviously protectionist measures to favor the producers of one country against their foreign competitors. I disagree with this. There is no theoretically respectable case for the argument that currency manipulation can be used as protectionism. But I would go much further; there is no intellectually respectable definition of currency manipulation. There is clearly a relationship between macroeconomic policy and industrial policy on the foreign trade side. . . . The nominal exchange rate is an instrument of macroeconomic policy, while tariffs, import quotas, export subsidies and taxes and voluntary export restraints can all be regarded as instruments of industrial policy. Yet an exchange-rate change can have “industrial” effects. It therefore seems useful to clarify the relationship between exchange-rate policy and the various micro or industrial-policy instruments. The first step is to distinguish a nominal from a real exchange-rate change and to introduce the concept of “exchange-rate protection. . . . If the exchange rate depreciates to the same extent as all costs and prices are rising (relative to costs and prices in other countries) there may be no real change at all. The nominal exchange rate is a monetary phenomenon, and it is possible that it is no more than that. A monetary authority may engineer a nominal devaluation designed to raise the domestic currency prices of exports and import-competing goods, and hence to benefit these industries. But if nominal wages quickly rise to compensate for the higher tradable-goods prices, no real effects – no rises in the absolute and relative profitability of tradable-goods industries – will remain. Monetary policy can influence the nominal-exchange rate, and possibly can even maintain it at a fixed value, but it cannot necessarily affect the real exchange rate. The real exchange rate refers to the relative price of tradable and non-tradable goods. While its absolute value is difficult to measure because of the ambiguity of the distinction between tradable and non-tradable goods, changes in it are usually – and reasonably – measured or indicated by relating changes in the nominal exchange rate to changes in some index of domestic prices or costs, or possibly to the average nominal wage level. This is sometimes called an index of competitiveness. A nominal devaluation will devalue the real exchange rate if there is some rigidity or sluggishness either in the prices of non-tradables or in nominal wages. The nominal devaluation will then raise the prices of tradables relative to wage costs and to labour-intensive non-tradables. Thus it protects tradables. This is “exchange-rate protection”. It protects the whole group of tradables relative to non-tradables. It will tnd ot shift resources into tradables out of non-tradables and domestic demand in the opposite direction. If at the same time macroeconomic policy ensures a demand-supply balance for non-tradables – hence decreasing aggregate demand (absorption) in real terms appropriately – a balance of payments surplus (or at least a lesser deficit than before) will result. This refers to the balance of payments on current account since the concurrent fiscal and monetary policies can have varying effects on private capital inflow. If the motive for the real devaluation was to protect tradables, then the current account surplus will be only a by-product, leading ot more accumulation of foreign exchange reserves than the country’s monetary authority really wanted. Alternatively, if the motive for the real devaluation was to build up the foreign-exchange reserves – or to stop their decline – then the protection of tradables will be the by-product. The main point to make is that a real exchange-rate change has effects on the relative and absolute profitability of different industries, a real devaluation favouring tradables relative to non-tradables, and a real appreciation the opposite. A nominal exchange-rate change can thus serve an industrial-policy purpose, provided it can be turned into a real exchange-rate change and that the incidental effects on the balance of payments are accepted. This does not mean that it is an optimal form of industrial policy. . . . [P]rotection policy could be directed more precisely to the industries to be protected, avoiding the by-product effect of an undesired balance-of-payments surplus; and in any case it can be argued that defensive protection policy is unlikely to be optimal, positive adjustment policy being preferable. Nevertheless, it is not difficult to find examples of countries that have practiced exchange-rate protection, if implicitly. They have intervened in the foreign-exchange market to prevent an appreciation of the exchange rate that might otherwise have taken place – or at least, they have “leaned against the wind.” – not because they really wanted to build up foreign-exchange reserves, but because they wanted to protect their tradable-goods industries – usually mainly their export industries. And the most egregious recent example of currency manipulation was undertaken by the Chinese central bank when it effectively pegged the yuan to the dollar at a fixed rate. Keeping its exchange rate fixed against the dollar was precisely the offense that the currency-manipulation police accused the Chinese of committing. Because currency manipulation does not exist as a coherent concept, I don’t see any evidence that the Chinese did it. But if I am wrong and it does exist, then it surely refers to the real exchange rate, not the nominal rate. Thus the fact that the nominal value of the Chinese yuan was pegged for a period of time has no relevance to whether the currency was being “manipulated”. The real value of the yuan was appreciating. One cannot conclude that an appreciating yuan means that China was not manipulating its currency. As I pointed out above, and as Corden explains, exchange-rate protection is associated with the accumulation of foreign-exchange reserves by the central bank. There is an ambiguity in interpreting the motivation of the central bank that is accumulating foreign-exchange reserves. Is it accumulating because it wants to increase the amount of reserves in its vaults, or are the increased holdings merely an unwelcome consequence of a policy being pursued for other reasons? In either case, the amount of foreign-exchange reserves a central bank is willing to hold is not unlimited. When the pile of reserves gets high enough, the policy causing accumulation may start to change, implying that the real exchange rate will start to rise. The dollar was pegged to gold from 1879 to 1933, and yet I don’t think the US government was “manipulating” the exchange rate. And if it was, it was not by fixing the gold price peg, it would have been by depreciating the real value of the dollar via policies that increased national saving, or reduced national investment, in order to run a current account surplus. In my view it is misleading to call policies that promote national saving “currency manipulation”, and even more so to put that label on just a subset of pro-saving policies. As in the case of the Bank of France after 1928, with a fixed exchange rate, whether a central bank is guilty of currency manipulation depends on whether the initial currency peg was chosen with a view toward creating a competitive advantage for the country’s tradable-goods sector. That was clearly an important motivation when the Bank of France chose the conversion rate between gold and the franc. I haven’t studied the choice of the dollar peg to gold in 1879. If economists want to use the term ‘currency manipulation’, then they first need to define the term. I have not seen any definitions that make any sense. I’m hoping that Corden’s definition works for Scott. It does for me. I arrived in Toronto last Thursday for the History of Economics Society Meeting at the University of Toronto (Trinity College to be exact) to give talks on Friday about two papers, one of which (“Hayek and Three Equilibrium Concepts: Sequential, Temporary and Rational Expectations”) I have been posting over the past few weeks on this blog (here, here, here, here, and here). I want to thank those of you who have posted your comments, which have been very helpful, and apologize for not responding to the more recent comments. The other paper about which I gave a talk was based on a post from three of years ago (“Real and Pseudo Gold Standards: Did Friedman Know the Difference?”) on which one of the sections of that paper was based. Here I am talking about Friedman. Milton Friedman discussed the gold standard in a number of works. His two main discussions of the gold standard appear in a 1951 paper on commodity-reserve currencies and in a 1961 paper on real and pseudo gold standards. In the 1951 paper, he distinguished between a gold standard in which only gold or warehouse certificates to equivalent amounts of gold circulated as a medium of exchange and one in which mere fiduciary claims to gold also circulated as media of exchange. Friedman called the former a strict gold standard and the latter as a partial gold standard. In the later paper, he distinguished between a gold standard in which gold is used as money, and a gold standard in which the government merely fixes the price of gold, dismissing the latter as a “pseudo” gold standard. In this paper, I first discuss the origin for the real/partial distinction, an analytical error, derived from David Hume via the nineteenth-century Currency School, about the incentives of banks to overissue convertible claims to base money, which inspired the Chicago plan for 100-percent reserve banking. I then discuss the real/pseudo distinction and argue that it was primarily motivated by the ideological objective of persuading libertarian and classical-liberal supporters of the gold standard to support a fiat standard supplemented by the k-percent quantity rule that Friedman was about to propose. Milton Friedman’s view of the gold standard was derived from his mentors at the University Chicago, an inheritance that, in a different context, he misleadingly described as the Chicago oral tradition. The Chicago view of the gold standard was, in turn, derived from the English Currency School of the mid-nineteenth century, which successfully promoted the enactment of the Bank Charter Act of 1844, imposing a 100-percent marginal reserve requirement on the banknotes issued by the Bank of England, and served as a model for the Chicago Plan for 100-percent-reserve banking. The Currency School, in turn, based its proposals for reform on the price-specie-flow analysis of David Hume (1742). The pure quantity-theoretic lineage of Friedman’s views of the gold standard and the intellectual debt that he owed to the Currency School and the Bank Charter Act disposed him to view the gold standard as nothing more than a mechanism for limiting the quantity of money. If the really compelling purpose and justification of the gold standard was to provide a limitation on the capacity of a government or a monetary authority to increase the quantity of money, then there was nothing special or exceptional about the gold standard. I have no interest in exploring the reasons why supporters of, and true believers in, the gold standard feel a strong ideological or emotional attachment to that institution, and even if I had such an interest, this would not be the place to enter into such an exploration, but I conjecture that the sources of that attachment to the gold standard go deeper than merely to provide a constraint on the power of the government to increase the quantity of money. But from Friedman’s quantity-theoretical perspective, if the primary virtue of the gold standard was that it served to limit the ability of the government to increase the quantity of money, if another institution could perform that service, it would serve just as well as the gold standard. The lesson that Friedman took from the efforts of the Currency School to enact the Bank Charter Act was that the gold standard, on its own, did not provide a sufficient constraint on the ability of private banks to increase the quantity of money. Otherwise, the 100-percent marginal reserve requirement of the Bank Charter Act would have been unnecessary. Now if the gold standard could not function well without additional constraints on the quantity of money, then obviously the constraint on the quantity of money that really matters is not the gold standard itself, but the 100-percent marginal reserve requirement imposed on the banking system. But if the relevant constraint on the quantity of money is the 100 percent marginal reserve requirement, then the gold standard is really just excess baggage. That was the view of Henry Simons and the other authors of the Chicago Plan. 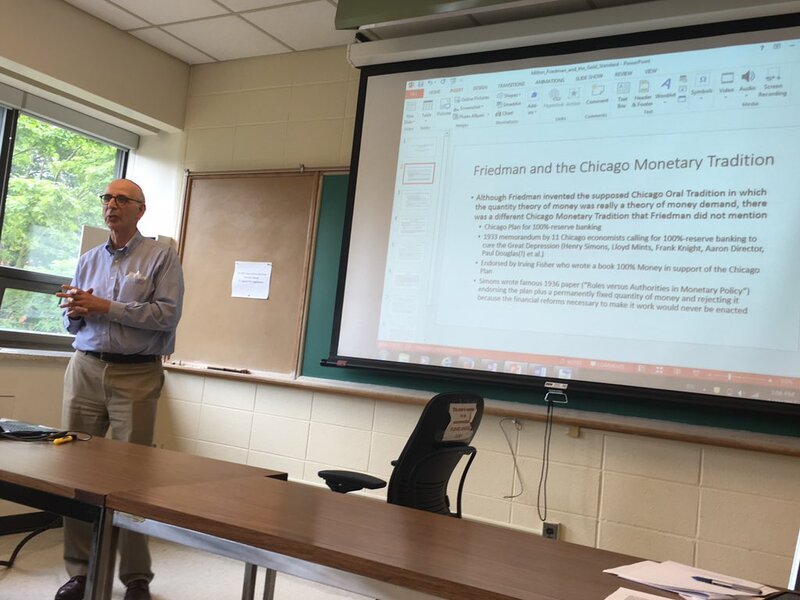 For a long time, Friedman accepted the Chicago Plan as the best prescription for monetary stability, but at about the time that he was writing his paper on real and pseudo gold standards, Friedman was frcoming to position that a k-percent rule would be a superior alternative to the old Chicago Plan. His paper on Pseudo gold standards for the Mont Pelerin Society was his initial attempt to persuade his libertarian and classical-liberal friends and colleagues to reconsider their support for the gold standard and prepare the ground for the k-percent rule that he was about to offer. But in his ideological enthusiasm he, in effect, denied the reality of the historical gold standard. Aside from the getting to talk about my papers, the other highlights of the HES meeting for me included the opportunity to renew a very old acquaintance with the eminent Samuel Hollander whom I met about 35 years ago at the first History of Economics Society meeting that I ever attended and making the acquaintance for the first time with the eminent Deidre McCloskey who was at both of my sessions and with the eminent E. Roy Weintraub who has been doing important research on my illustrious cousin Abraham Wald, the first one to prove the existence of a competitive equilibrium almost 20 years before Arrow, Debreu and McKenzie came up with their proofs. Doing impressive and painstaking historical research Weintraub found a paper, long thought to have been lost in which Wald, using the fixed-point theorem that Arrow, Debreu and McKenzie had independently used in their proofs, gave a more general existence proof than he had provided in his published existence proofs, clearly establishing Wald’s priority over Arrow, Debreu and McKenzie in proving the existence of general equilibrium. In this, my final, installment on Hayek and intertemporal equilibrium, I want to focus on a particular kind of intertemporal equilibrium: rational-expectations equilibrium. In his discussions of intertemporal equilibrium, Roy Radner assigns a meaning to the term “rational-expectations equilibrium” very different from the meaning normally associated with that term. Radner describes a rational-expectations equilibrium as the equilibrium that results when some agents are able to make inferences about the beliefs held by other agents when observed prices differ from what they had expected prices to be. Agents attribute the differences between observed and expected prices to information held by agents better informed than themselves, and revise their own expectations accordingly in light of the information that would have justified the observed prices. At RAND in 1954, Armen A. Alchian conducted the world’s first event study to infer the fuel material used in the manufacturing of the newly-developed hydrogen bomb. Successfully identifying lithium as the fusion fuel using only publicly available financial data, the paper was seen as a threat to national security and was immediately confiscated and destroyed. The bomb’s construction being secret at the time but having since been partially declassified, the nuclear tests of the early 1950s provide an opportunity to observe market efficiency through the dissemination of private information as it becomes public. I replicate Alchian’s event study of capital market reactions to the Operation Castle series of nuclear detonations in the Marshall Islands, beginning with the Bravo shot on March 1, 1954 at Bikini Atoll which remains the largest nuclear detonation in US history, confirming Alchian’s results. The Operation Castle tests pioneered the use of lithium deuteride dry fuel which paved the way for the development of high yield nuclear weapons deliverable by aircraft. I find significant upward movement in the price of Lithium Corp. relative to the other corporations and to DJIA in March 1954; within three weeks of Castle Bravo the stock was up 48% before settling down to a monthly return of 28% despite secrecy, scientific uncertainty, and public confusion surrounding the test; the company saw a return of 461% for the year. Radner also showed that the ability of some agents to infer the information on which other agents are causing prices to differ from the prices that had been expected does not necessarily lead to an equilibrium. The process of revising expectations in light of observed prices may not converge on a shared set of expectations of the future based on commonly shared knowledge. So rather than pursue Radner’s conception of rational expectations, I will focus here on the conventional understanding of “rational expectations” in modern macroeconomics, which is that the price expectations formed by the agents in a model should be consistent with what the model itself predicts that those future prices will be. In this very restricted sense, I believe rational expectations is a very important property that any model ought to have. It simply says that a model ought to have the property that if one assumes that the agents in a model expect the equilibrium predicted by the model, then, given those expectations, the solution of the model will turn out to be the equilibrium of the model. This property is a consistency and coherence property that any model, regardless of its substantive predictions, ought to have. If a model lacks this property, there is something wrong with the model. But there is a huge difference between saying that a model should have the property that correct expectations are self-fulfilling and saying that agents are in fact capable of predicting the equilibrium of the model. Assuming the former does not entail the latter. What kind of crazy model would have the property that correct expectations are not self-fulfilling? I mean think about: a model in which correct expectations are not self-fulfilling is a nonsense model. But demanding that a model not spout out jibberish is very different from insisting that the agents in the model necessarily have the capacity to predict what the equilibrium of the model will be. Rational expectations in the first sense is a minimal consistency property of an economic model; rational expectations in the latter sense is an empirical assertion about the real world. You can make such an assumption if you want, but you can’t claim that it is a property of the real world. Whether it is a property of the real world is a matter of fact, not a matter of methodological fiat. But methodological fiat is what rational expectations has become in macroeconomics. In his 1937 paper on intertemporal equilibrium, Hayek was very clear that correct expectations are logically implied by the concept of an equilibrium of plans extending through time. But correct expectations are not a necessary, or even descriptively valid, characteristic of reality. Hayek also conceded that we don’t even have an explanation in theory of how correct expectations come into existence. He merely alluded to the empirical observation – perhaps not the most accurate description of empirical reality in 1937 – that there is an observed general tendency for markets to move toward equilibrium, implying that over time expectations do tend to become more accurate. It is worth pointing out that when the idea of rational expectations was introduced by John Muth in the early 1960s, he did so in the context of partial-equilibrium models in which the rational expectation in the model was the rational expectation of the equilibrium price in a paraticular market. The motivation for Muth to introduce the idea of a rational expectation was idea of a cobweb cycle in which producers simply assume that the current price will remain at whatever level currently prevails. If there is a time lag between production, as in agricultural markets between the initial application of inputs and the final yield of output, it is easy to generate an alternating sequence of boom and bust, with current high prices inducing increased output in the following period, driving prices down, thereby inducing low output and high prices in the next period and so on. Muth argued that rational producers would not respond to price signals in a way that led to consistently mistaken expectations, but would base their price expectations on more realistic expectations of what future prices would turn out to be. In his microeconomic work on rational expectations, Muth showed that the rational-expectation assumption was a better predictor of observed prices than the assumption of static expectations underlying the traditional cobweb-cycle model. So Muth’s rational-expectations assumption was based on a realistic conjecture of how real-world agents would actually form expectations. In that sense, Muth’s assumption was consistent with Hayek’s conjecture that there is an empirical tendency for markets to move toward equilibrium. So while Muth’s introduction of the rational-expectations hypothesis was an empirically progressive theoretical innovation, extending rational-expectations into the domain of macroeconomics has not been empirically progressive, rational expectations models having consistently failed to generate better predictions than macro-models using other expectational assumptions. Instead, a rational-expectations axiom has been imposed as part of a spurious methodological demand that all macroeconomic models be “micro-founded.” But the deeper point – a point that Hayek understood better than perhaps anyone else — is that there is a huge difference in kind between forming rational expectations about a single market price and forming rational expectations about the vector of n prices on the basis of which agents are choosing or revising their optimal intertemporal consumption and production plans. It is one thing to assume that agents have some expert knowledge about the course of future prices in the particular markets in which they participate regularly; it is another thing entirely to assume that they have knowledge sufficient to forecast the course of all future prices and in particular to understand the subtle interactions between prices in one market and the apparently unrelated prices in another market. The former kind of knowledge is knowledge that expert traders might be expected to have; the latter kind of knowledge is knowledge that would be possessed by no one but a nearly omniscient central planner, whose existence was shown by Hayek to be a practical impossibility. Standard macroeconomic models are typically so highly aggregated that the extreme nature of the rational-expectations assumption is effectively suppressed. To treat all output as a single good (which involves treating the single output as both a consumption good and a productive asset generating a flow of productive services) effectively imposes the assumption that the only relative price that can ever change is the wage, so that all but one future relative prices are known in advance. That assumption effectively assumes away the problem of incorrect expectations except for two variables: the future price level and the future productivity of labor (owing to the productivity shocks so beloved of Real Business Cycle theorists). Having eliminated all complexity from their models, modern macroeconomists, purporting to solve micro-founded macromodels, simply assume that there is but one or at most two variables about which agents have to form their rational expectations. Four score years since Hayek explained how challenging the notion of intertemporal equilibrium really is and the difficulties inherent in explaining any empirical tendency toward intertempral equilibrium, modern macroeconomics has succeeded in assuming all those difficulties out of existence. Many macroeconomists feel rather proud of what modern macroeconomics has achieved. I am not quite as impressed as they are. In my three previous posts (here, here, and here) about intertemporal equilibrium, I have been emphasizing that the defining characteristic of an intertemporal equilibrium is that agents all share the same expectations of future prices – or at least the same expectations of those future prices on which they are basing their optimizing plans – over their planning horizons. At a given moment at which agents share the same expectations of future prices, the optimizing plans of the agents are consistent, because none of the agents would have any reason to change his optimal plan as long as price expectations do not change, or are not disappointed as a result of prices turning out to be different from what they had been expected to be. The failure of expected prices to be fulfilled would therefore signify that the information available to agents in forming their expectations and choosing optimal plans conditional on their expectations had been superseded by newly obtained information. The arrival of new information can thus be viewed as a cause of disequilibrium as can any difference in information among agents. The relationship between information and equilibrium can be expressed as follows: differences in information or differences in how agents interpret information leads to disequilibrium, because those differences lead agents to form differing expectations of future prices. Now the natural way to generalize the intertemporal equilibrium model is to allow for agents to have different expectations of future prices reflecting their differences in how they acquire, or in how they process, information. But if agents have different information, so that their expectations of future prices are not the same, the plans on which agents construct their subjectively optimal plans will be inconsistent and incapable of implementation without at least some revisions. But this generalization seems incompatible with the equilibrium of optimal plans, prices and price expectations described by Roy Radner, which I have identified as an updated version of Hayek’s concept of intertemporal equilibrium. The question that I want to explore in this post is how to reconcile the absence of equilibrium of optimal plans, prices, and price expectations, with the intuitive notion of market clearing that we use to analyze asset markets and markets for current delivery. If markets for current delivery and for existing assets are in equilibrium in the sense that prices are adjusting in those markets to equate demand and supply in those markets, how can we understand the idea that the optimizing plans that agents are seeking to implement are mutually inconsistent? The classic attempt to explain this intermediate situation which partially is and partially is not an equilibrium, was made by J. R. Hicks in 1939 in Value and Capital when he coined the term “temporary equilibrium” to describe a situation in which current prices are adjusting to equilibrate supply and demand in current markets even though agents are basing their choices of optimal plans to implement over time on different expectations of what prices will be in the future. The divergence of the price expectations on the basis of which agents choose their optimal plans makes it inevitable that some or all of those expectations won’t be realized, and that some, or all, of those agents won’t be able to implement the optimal plans that they have chosen, without at least some revisions. In Hayek’s early works on business-cycle theory, he argued that the correct approach to the analysis of business cycles must be analyzed as a deviation by the economy from its equilibrium path. The problem that he acknowledged with this approach was that the tools of equilibrium analysis could be used to analyze the nature of the equilibrium path of an economy, but could not easily be deployed to analyze how an economy performs once it deviates from its equilibrium path. Moreover, cyclical deviations from an equilibrium path tend not to be immediately self-correcting, but rather seem to be cumulative. Hayek attributed the tendency toward cumulative deviations from equilibrium to the lagged effects of monetary expansion which cause cumulative distortions in the capital structure of the economy that lead at first to an investment-driven expansion of output, income and employment and then later to cumulative contractions in output, income, and employment. But Hayek’s monetary analysis was never really integrated with the equilibrium analysis that he regarded as the essential foundation for a theory of business cycles, so the monetary analysis of the cycle remained largely distinct from, if not inconsistent with, the equilibrium analysis. I would suggest that for Hayek the Hicksian temporary-equilibrium construct would have been the appropriate theoretical framework within which to formulate a monetary analysis consistent with equilibrium analysis. Although there are hints in the last part of The Pure Theory of Capital that Hayek was thinking along these lines, I don’t believe that he got very far, and he certainly gave no indication that he saw in the Hicksian method the analytical tool with which to weave the two threads of his analysis. I will now try to explain how the temporary-equilibrium method makes it possible to understand the conditions for a cumulative monetary disequilibrium. I make no attempt to outline a specifically Austrian or Hayekian theory of monetary disequilibrium, but perhaps others will find it worthwhile to do so. As I mentioned in my previous post, agents understand that their price expectations may not be realized, and that their plans may have to be revised. Agents also recognize that, given the uncertainty underlying all expectations and plans, not all debt instruments (IOUs) are equally reliable. The general understanding that debt – promises to make future payments — must be evaluated and assessed makes it profitable for some agents to specialize in in debt assessment. Such specialists are known as financial intermediaries. And, as I also mentioned previously, the existence of financial intermediaries cannot be rationalized in the ADM model, because, all contracts being made in period zero, there can be no doubt that the equilibrium exchanges planned in period zero will be executed whenever and exactly as scheduled, so that everyone’s promise to pay in time zero is equally good and reliable. For our purposes, a particular kind of financial intermediary — banks — are of primary interest. The role of a bank is to assess the quality of the IOUs offered by non-banks, and select from the IOUs offered to them those that are sufficiently reliable to be accepted by the bank. Once a prospective borrower’s IOU is accepted, the bank exchanges its own IOU for the non-bank’s IOU. No non-bank would accept a non-bank’s IOU, at least not on terms as favorable as those on which the bank offers in accepting an IOU. In return for the non-bank IOU, the bank credits the borrower with a corresponding amount of its own IOUs, which, because the bank promises to redeem its IOUs for the numeraire commodity on demand, is generally accepted at face value. Thus, bank debt functions as a medium of exchange even as it enables non-bank agents to make current expenditures they could not have made otherwise if they can demonstrate to the bank that they are sufficiently likely to repay the loan in the future at agreed upon terms. Such borrowing and repayments are presumably similar to the borrowing and repayments that would occur in the ADM model unmediated by any financial intermediary. In assessing whether a prospective borrower will repay a loan, the bank makes two kinds of assessments. First, does the borrower have sufficient income-earning capacity to generate enough future income to make the promised repayments that the borrower would be committing himself to make? Second, should the borrower’s future income, for whatever reason, turn out to be insufficient to finance the promised repayments, does the borrower have collateral that would allow the bank to secure repayment from the collateral offered as security? In making both kinds of assessments the bank has to form an expectation about the future — the future income of the borrower and the future value of the collateral. In a temporary-equilibrium context, the expectations of future prices held by agents are not the same, so the expectations of future prices of at least some agents will not be accurate, and some agents won’tbe able to execute their plans as intended. Agents that can’t execute their plans as intended are vulnerable if they have incurred future obligations based on their expectations of future prices that exceed their repayment capacity given the future prices that are actually realized. If they have sufficient wealth — i.e., if they have asset holdings of sufficient value — they may still be able to repay their obligations. However, in the process they may have to sell assets or reduce their own purchases, thereby reducing the income earned by other agents. Selling assets under pressure of obligations coming due is almost always associated with selling those assets at a significant loss, which is precisely why it usually preferable to finance current expenditure by borrowing funds and making repayments on a fixed schedule than to finance the expenditure by the sale of assets. Now, in adjusting their plans when they observe that their price expectations are disappointed, agents may respond in two different ways. One type of adjustment is to increase sales or decrease purchases of particular goods and services that they had previously been planning to purchase or sell; such marginal adjustments do not fundamentally alter what agents are doing and are unlikely to seriously affect other agents. But it is also possible that disappointed expectations will cause some agents to conclude that their previous plans are no longer sustainable under the conditions in which they unexpectedly find themselves, so that they must scrap their old plans replacing them with completely new plans instead. In the latter case, the abandonment of plans that are no longer viable given disappointed expectations may cause other agents to conclude that the plans that they had expected to implement are no longer profitable and must be scrapped. When agents whose price expectations have been disappointed respond with marginal adjustments in their existing plans rather than scrapping them and replacing them with new ones, a temporary equilibrium with disappointed expectations may still exist and that equilibrium may be reached through appropriate price adjustments in the markets for current delivery despite the divergent expectations of future prices held by agents. Operation of the price mechanism may still be able to achieve a reconciliation of revised but sub-optimal plans. The sub-optimal temporary equilibrium will be inferior to the allocation that would have resulted had agents all held correct expectations of future prices. Nevertheless, given a history of incorrect price expectations and misallocations of capital assets, labor, and other factors of production, a sub-optimal temporary equilibrium may be the best feasible outcome. But here’s the problem. There is no guarantee that, when prices turn out to be very different from what they were expected to be, the excess demands of agents will adjust smoothly to changes in current prices. A plan that was optimal based on the expectation that the price of widgets would be $500 a unit may well be untenable at a price of $120 a unit. When realized prices are very different from what they had been expected to be, those price changes can lead to discontinuous adjustments, violating a basic assumption — the continuity of excess demand functions — necessary to prove the existence of an equilibrium. Once output prices reach some minimum threshold, the best response for some firms may be to shut down, the excess demand for the product produced by the firm becoming discontinuous at the that threshold price. The firms shutting down operations may be unable to repay loans they had obligated themselves to repay based on their disappointed price expectations. If ownership shares in firms forced to cease production are held by households that have predicated their consumption plans on prior borrowing and current repayment obligations, the ability of those households to fulfill their obligations may be compromised once those firms stop paying out the expected profit streams. Banks holding debts incurred by firms or households that borrowers cannot service may find that their own net worth is reduced sufficiently to make the banks’ own debt unreliable, potentially causing a breakdown in the payment system. Such effects are entirely consistent with a temporary-equilibrium model if actual prices turn out to be very different from what agents had expected and upon which they had constructed their future consumption and production plans. Sufficiently large differences between expected and actual prices in a given period may result in discontinuities in excess demand functions once prices reach critical thresholds, thereby violating the standard continuity assumptions on which the existence of general equilibrium depends under the fixed-point theorems that are the lynchpin of modern existence proofs. C. J. Bliss made such an argument in a 1983 paper (“Consistent Temporary Equilibrium” in the volume Modern Macroeconomic Theory edited by J. P. Fitoussi) in which he also suggested, as I did above, that the divergence of individual expectations implies that agents will not typically regard the debt issued by other agents as homogeneous. Bliss therefore posited the existence of a “Financier” who would subject the borrowing plans of prospective borrowers to an evaluation process to determine if the plan underlying the prospective loan sought by a borrower was likely to generate sufficient cash flow to enable the borrower to repay the loan. The role of the Financier is to ensure that the plans that firms choose are based on roughly similar expectations of future prices so that firms will not wind up acting on price expectations that must inevitably be disappointed. I am unsure how to understand the function that Bliss’s Financier is supposed to perform. Presumably the Financier is meant as a kind of idealized companion to the Walrasian auctioneer rather than as a representation of an actual institution, but the resemblance between what the Financier is supposed to do and what bankers actually do is close enough to make it unclear to me why Bliss chose an obviously fictitious character to weed out business plans based on implausible price expectations rather than have the role filled by more realistic characters that do what their real-world counterparts are supposed to do. Perhaps Bliss’s implicit assumption is that real-world bankers do not constrain the expectations of prospective borrowers sufficiently to suggest that their evaluation of borrowers would increase the likelihood that a temporary equilibrium actually exists so that only an idealized central authority could impose sufficient consistency on the price expectations to make the existence of a temporary equilibrium likely. But from the perspective of positive macroeconomic and business-cycle theory, explicitly introducing banks that simultaneously provide an economy with a medium of exchange – either based on convertibility into a real commodity or into a fiat base money issued by the monetary authority – while intermediating between ultimate borrowers and ultimate lenders seems to be a promising way of modeling a dynamic economy that sometimes may — and sometimes may not — function at or near a temporary equilibrium. We observe economies operating in the real world that sometimes appear to be functioning, from a macroeconomic perspective, reasonably well with reasonably high employment, increasing per capita output and income, and reasonable price stability. At other times, these economies do not function well at all, with high unemployment and negative growth, sometimes with high rates of inflation or with deflation. Sometimes, these economies are beset with financial crises in which there is a general crisis of solvency, and even apparently solvent firms are unable to borrow. A macroeconomic model should be able to account in some way for the diversity of observed macroeconomic experience. The temporary equilibrium paradigm seems to offer a theoretical framework capable of accounting for this diversity of experience and for explaining at least in a very general way what accounts for the difference in outcomes: the degree of congruence between the price expectations of agents. When expectations are reasonably consistent, the economy is able to function at or near a temporary equilibrium which is likely to exist. When expectations are highly divergent, a temporary equilibrium may not exist, and even if it does, the economy may not be able to find its way toward the equilibrium. Price adjustments in current markets may be incapable of restoring equilibrium inasmuch as expectations of future prices must also adjust to equilibrate the economy, there being no market mechanism by which equilibrium price expectations can be adjusted or restored. This, I think, is the insight underlying Axel Leijonhufvud’s idea of a corridor within which an economy tends to stay close to an equilibrium path. However if the economy drifts or is shocked away from its equilibrium time path, the stabilizing forces that tend to keep an economy within the corridor cease to operate at all or operate only weakly, so that the tendency for the economy to revert back to its equilibrium time path is either absent or disappointingly weak. The temporary-equilibrium method, it seems to me, might have been a path that Hayek could have successfully taken in pursuing the goal he had set for himself early in his career: to reconcile equilibrium-analysis with a theory of business cycles. Why he ultimately chose not to take this path is a question that, for now at least, I will leave to others to try to answer.